When it comes to interior design, our philosophy is simple...it's all about you. It's your space, so it must reflect your needs and your budget. 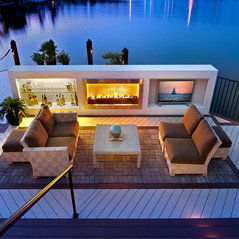 Whether for your home or business, our goal is to assist you in creating an improved environment, cost effectively. We work with you to create a style that fits your needs. 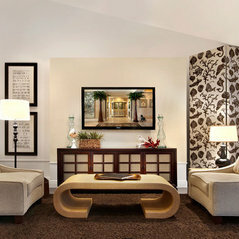 Take a tour of the homes in our projects. 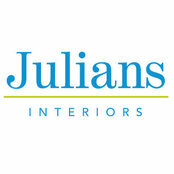 Each Julians Interiors project has a unique story with its own challenges, parameters and design solutions. Weekend Retreat: A Modern Twist on "Beachy"
Kommentiert: Who is the dinning chairs manufacturer, pleaseHi thank you for your comment. This is a line only available for designers but we would be more than happy to order for you if you are interested. Kommentiert: What manufacturer made the couch? What fabric did you use? Nice!Thank you for your interest! 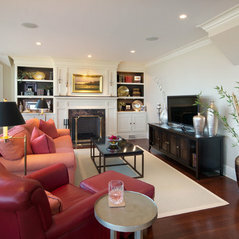 The sectional and fabric are both from Norwalk Furniture. Kommentiert: LOVE THE VANITY and the MIRROR - Where can I get the vanity?Thank you very much!! Kommentiert: What is the name of the pool liner?Thank you for your interest! We will have to check with the client and get back to you. Kommentiert: WallpaperIt is a Thibaut wallpaper. We would be glad to get it for you! Kommentiert: What shade of brown is this?Thank you for you interest! 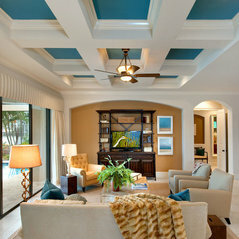 The ceiling color is Manitou Blue by Sherwin Williams.